The National Football League just can’t seem to avoid controversy. But the newest event that is generating national negative response and reaction speaks to a pair of larger issues, while also underscoring what definitely looks like at best hypocrisy and at worse just continued collusion against a player. 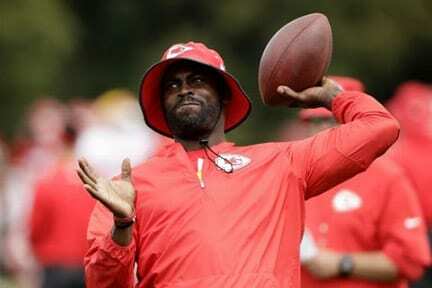 This event follows a summer where Vick was a coaching intern with the Kansas City Chiefs. Many felt he would eventually become a coach somewhere in the league, and that indeed may still happen. But right now it seems his future is in broadcasting. But just in case Fox thought that Vick’s past had been forgotten, the group Rally For Animals surfaced with an online petition urging Fox to rescind that hiring. At press time there were more than 34,000 signatures on it. For those who’ve forgotten, Vick spent more than 21 months in federal prison for his involvement (some say he was the leader and organizer) of a dogfighting ring. Before that happened, he had become a major NFL celebrity, being the first QB to have a 1,000-yard rushing season (2006). But after participation in dogfighting surfaced, he was eventually tried and convicted, and it took the advocacy of several influential people, especially former coach and current Sunday Night Football analyst Tony Dungey, to get him back on a team. Vick hasn’t been in the league since 2015. Now whether individual groups and/or organizations choose to forgive Vick’s past is one thing. He has served his time and deserves the same opportunity as any other person to rehabilitate and reshape his image. But what does seem odd is that NFL owners (who must approve all broadcast hires) don’t have a problem with someone who has gone to prison, but DOES have a problem with someone whose record is spotless, but who has done nothing other than take a knee. The Colin Kaepernick issue just won’t go away, and the Vick hiring really makes things even stickier. Alltime great Jim Brown didn’t endear himself to a lot of folks last week either, with his comments about Kaepernick having to choose between being a QB and an activist. This is the same person who stood with Bill Russell, Kareem Abdul-Jabbar and other noted Black athletes back in the 60s to defend Muhammad Ali’s right to refuse induction into the armed forces as a matter of principle. Amazing that he now can’t see that Kaepernick choosing to protest was also a matter of principle, that he needn’t have to make a choice, and that NFL ownership is simply punishing him for his stance. That decision looks even stranger when contrasted with the fact Michael Vick’s past history doesn’t disqualify him from employment with the league, but Kaepernick’s present stances prove too disturbing.